One of the most highly anticipated spring events on campus is without a doubt the Student Dance Concert. This year’s concert opened with the work Solas an Lae (which means “daylight” in Gaelic), choreographed by Sharon Friedler, Stephen Lang Professor of Dance and director of the Dance Program. Friedler says she was inspired by personal impressions of light, shadow, wind, and waves along the coast of Northern Ireland that were reinforced by conversations with Managing Director of the Lang Performing Arts James Murphy, who had also visited the region. Landscape paintings of the area by Professor of Studio Art Randall Exon evoked further memories of the unusual interplay of light and landscape observed by Friedler and Murphy. At various stages of the piece’s creation, Friedler had listened to the music of harpist Johanna Bond ’10 and envisioned an essential role for the harp in the piece. 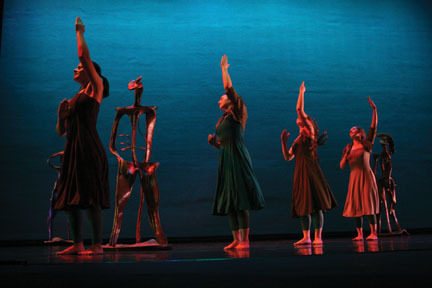 She also incorporated sculptures by Phillip Stern ’84—whose hybrid figurative forms include combinations of human and harp shapes—into the stage setting. The work had originally been slated for performance in the February Faculty Dance Concert, in which Friedler had intended to perform herself, but the February concert was canceled due to a snowstorm. Working in collaboration with dancers Rachel Crane ’13, Amelia Kidd ’11, Ashley Miniet ’10, and Anne Tucci ’10, Friedler restyled the piece for the student concert, where it was performed to a Matt Mayberry arrangement of “Clocks” by Berryman, Buckland, Champion, and Martin.